Gupta's Burger! Rahul's ande! He he he. Yeah, these are real food names! Why would you see them in a fancy hotel's menu? Somethings are not easily accessible for many of us. 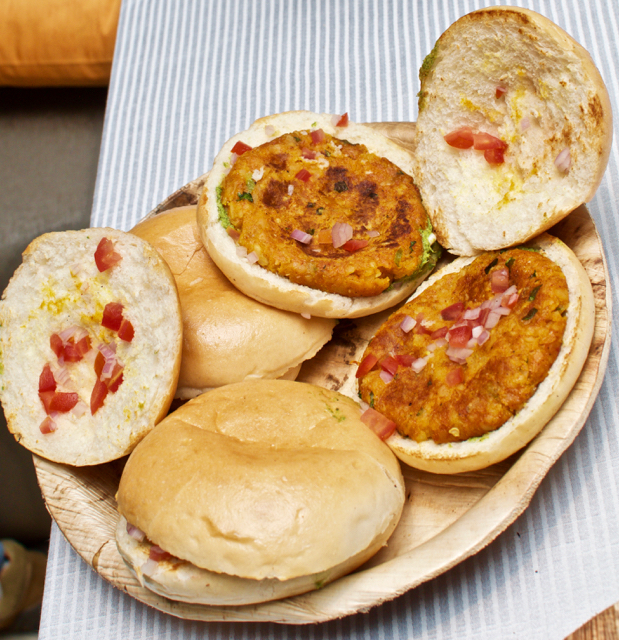 Like one of the best buffets in town being located a long drive away on OMR. OK, there is a sizeable population on OMR, but for the folks in Chennai (yes, pun intended), buffets are defined as loads of mediocre food! BUZZ, the all day dining at the Gateway Taj on OMR has this super star chef whose brunch I had the privilege of enjoying! Now the dinner buffet! Normally food festivals as part of the buffets have a few dishes here n there, but the sheer number of dishes from the festival is mind boggling. And add stuff like Gupta and Rahul's dishes from the streets of Delhi, you realise that these guys are serious about their food festivals too! 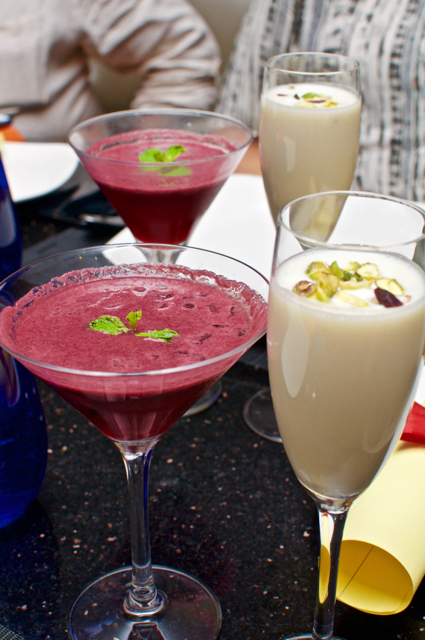 The drink maybe far from Delhi, but when you have that spiced Angoor Sherbet, you won't care where it came from! In my limited knowledge, I think it is from the North West frontier region, but simply doesn't matter. And the thick lassi! 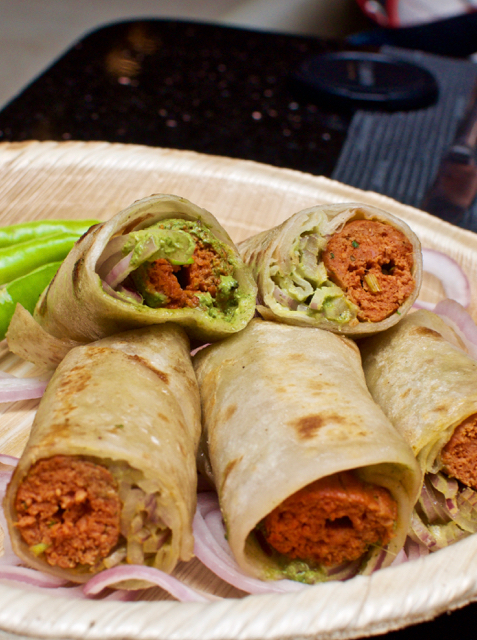 And then the sheekh kebab roll that was juicy. I mean, getting juicy kebabs in Chennai is like finding the blue moon, but finding juicy lamb kebabs in a roll is like finding.....well oil! While I was sure I wanted to taste lots of food and so wanted to take tiny bits from every dish, I simply couldn't resist that sheekh kebab! Simply not possible! Had two rolls! You agree that five star versions of street foods may not match up to the originals, but sometimes they do! 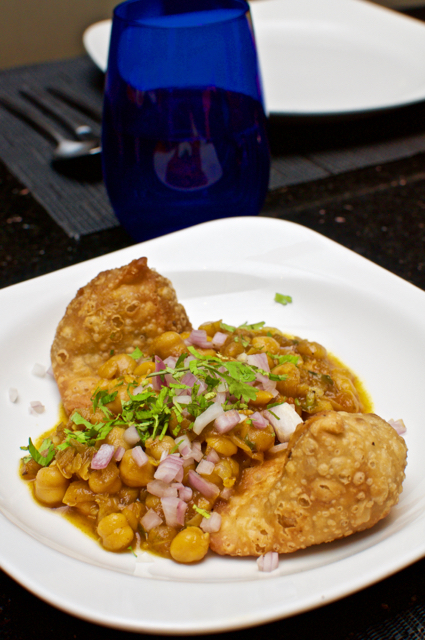 Samosa chat! Ha ha ha! Oh man! Super yummy! Except the flavour of the trans fat laden oil from the streets of Delhi, they brought every other flavour in to these samosas! The aloo chat! Another ha ha ha moment. 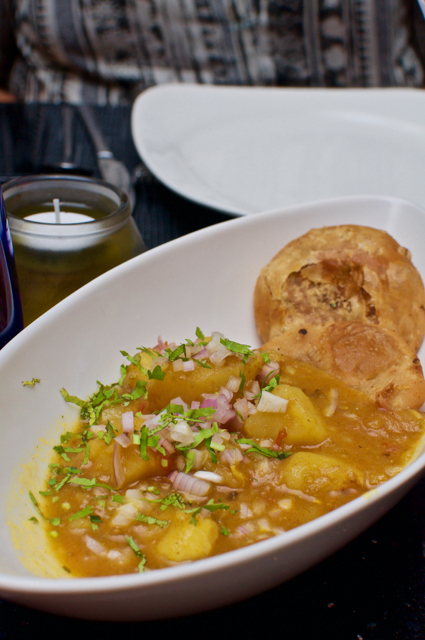 One little kachori with a potato gravy! Whoa! There was a certain yumminess quotient that is rarely found in the buffets! 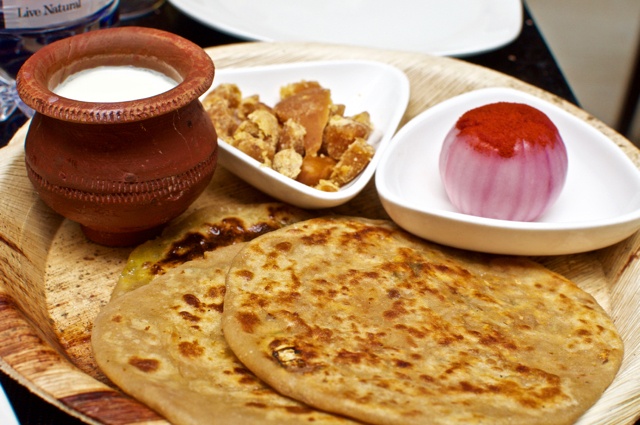 The parathas from the gallis of Delhi made appearance, but just one stole the show! The Amritsar Kulcha was nothing like the ones in the streets Delhi, but everything like the ones in Delhi. Contradiction, yes! But one that is very difficult to explain. non-glamourous stuff from the streets of Delhi. They've brought everything! The good and the average! I didn't like the shorba! Yes, it wasn't up to the mark for me and possibly the only dish that was off mark completely! There was absolutely no space left for the main courses! 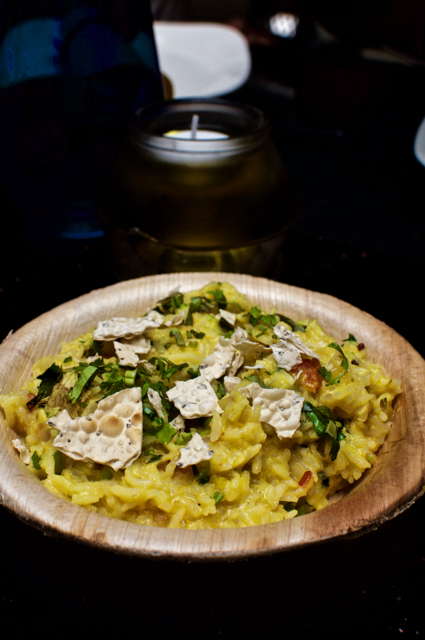 Borrowed some space to try the Kadi Chawal, basically a comfort rice dish that was yummy! The thing about comfort food is that it is not so comfortable for everyone! Your mom's dish maybe comfort food for you, but not me. So taking a Delhi comfort food and making it likeable to the folks of Chennai is an achievement in itself! Sorry, I don't have much to write about the other main course dishes as the rest of the organs refused to lend any more space to the stomach! Dessert goes to the heart which had some space. 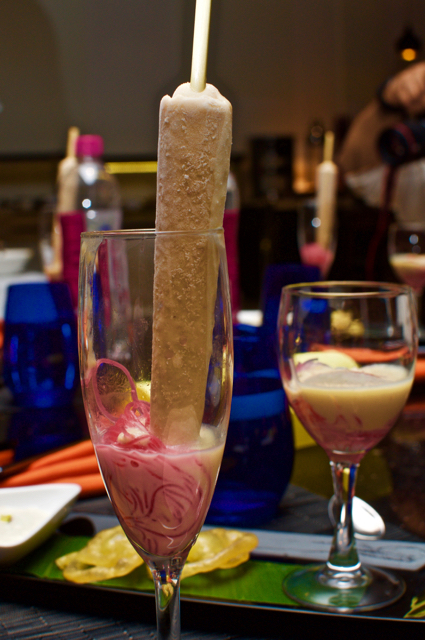 No street food stuff here, just classy Rabdi Falooda with Kulfi in a tall wine glass! Flavours of Delhi alright, but fully 5 star! While food festivals are challenging, bringing street food to the hotels is a bigger challenge that I've seen even the best of chefs fumble. There is so much that you cannot bring from street food and while you can have Mexican festivals and Royal cuisine festivals, a street food festival is a mighty challenge. Chef Meril has managed to bring a large part of it here and my respect for this chef has gone up a few notches. He has to be closer to the city, but hey IT folks on OMR! He is your's for the time being! Oh, I have to mention that his Sunday Brunch at Rs. 1350 (non alcohol) is one that I would starve the previous day for! Dinner is priced at Rs. 1200 plus taxes that works out to about 1470 per person!